Frown lines, creases along the forehead, and a sagging brow can be significantly rejuvenated with browlift surgery. Also known as a forehead lift, browlift surgery addresses signs of age and fatigue in the upper part of the face that can make us look older and more tired than we actually are. By lifting the brow, this effective procedure can also improve vision for patients experiencing visual obstruction due to a low brow position or sagging skin. Our board-certified facial plastic surgeon, John Vartanian, MD offers his own advanced endoscopic browlift technique – a less invasive surgical procedure designed to produce virtually undetectable scarring and lead to a quicker recovery time. 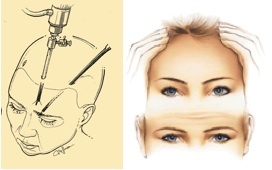 Dr. Vartanian also utilizes the Endotine forehead fixation method to ensure reliable brow position maintenance. With browlift surgery, Dr. Vartanian can help you attain a more youthful and refreshed appearance. The position of the brows are unique to every individual based on the shape of the eyes, facial features in the upper part of the face, and the ways in which the appearance of the eyebrows are shaped and maintained, such as with regular plucking routines. However, a variety of factors – such as the natural effects of gravity and aging – can cause the brows to descend and lose their position. When this occurs, extra skin can be pushed into the upper eyelid areas, giving the eyes a “crowded” appearance and even making it difficult to see when looking in certain directions. Frown lines and deep creases can also appear in the upper part of the face, which often lead many people to experience a fatigued, stressed, or even angry appearance. An endoscopic browlift can effectively rejuvenate the brows and give these areas a more rested and relaxed look. The brows can be lifted to a higher or more symmetrical position, frown lines can be diminished, and creases along the forehead can be smoothed out with results that provide you with a more alert and youthful aesthetic. In many cases, pre-existing brow asymmetry can be improved and brow shape improved to what the patient desires. In cases where heavy and droopy brows can limit vision, by lifting the brows, excess skin over the eyes is also significantly reduced, allowing you to see more clearly without obstructed fields of vision, and eyelid surgery is another option for this concern. Since browlift results often last for a number of years, this procedure can also be beneficial, and more cost-effective, for patients who do not wish to undergo continuous BOTOX® Cosmetic or Dysport® treatments for forehead rejuvenation. Dr. Vartanian will explain in detail the customized treatment plan during the initial browlift consultation and discuss all aspects of this procedure and answer any questions you may have. An endoscopic browlift is an advanced technique designed to minimize your recovery time and result in virtually invisible incisions. Dr. Vartanian will conduct the procedure using very small instruments and a special camera that relays images of the surgical field to a computer monitor, which allows for a unique and incredibly precise view. Several miniscule incisions will be placed discreetly behind the hairline. Dr. Vartanian angles these incisions in such a way that they are completely hidden under the hair. Excess skin is removed and the remaining skin and muscles are tightened to smooth out wrinkles and heighten the position of the brows. Dr. Vartanian is also very careful when closing the incisions to prevent any hair loss at the incision site. The entire procedure typically takes about one to two hours to complete, and can be performed on an outpatient basis. Recovery from the endoscopic browlift typically involves some bruising and swelling in the treatment areas; however, this should fade fairly quickly over the ensuing days. Any discomfort during the recovery period can be controlled with medication. Most patients are able to return to normal daily activities within one week. Dr. Vartanian will advise you to avoid strenuous activities for 3-4 weeks. Length of Time for Procedure? One to two hours; however, exact procedure times depend on each individual patient’s needs. Who Performs this Procedure? Dr. Vartanian performs all browlifts himself from start to finish. What about Recovery? With endoscopic browlift surgery, recovery time is usually minimal, and scarring is well-hidden along the hairline. What about the Results? Browlift surgery is designed to help you reduce the appearance of creases along the forehead, wrinkles and furrows between the brows, and excess skin over the eyes. Ultimately, this procedure can help to give you a more youthful and relaxed look. If you would like more information on browlift surgery, or if you would like to schedule a consultation with our facial plastic surgeon, please contact Dr. Vartanian today.